The seemingly endless controversy surrounding the character of Apu on The Simpsons continues to grow. Now adding to the cluttered conversation are Matt Stone and Trey Parker, who took some confusing shots at the show (or was it at the controversy?) with a new episode of South Park. The episode was entitled "The Problem with a Poo" and saw the show's Mr. Hankey banished from South Park after tweeting some nasty jokes about the town. He blamed it on Ambien, of course, in a winking reference to Roseanne Barr. Randy then told Stan that Mr. Hankey would "have to go to a place that accepts racist, awful beings like him. There are still places out there who don't care about bigotry and hate." 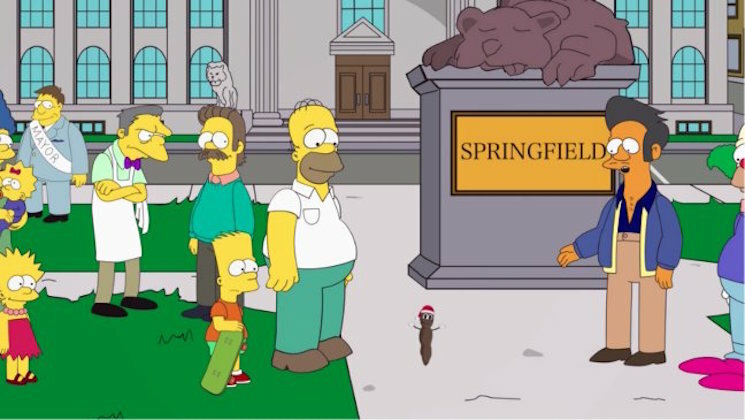 Hankey then went to Springfield, where he hung out with just about everyone from The Simpsons — including Apu. The show ended with a stark black and white screen featuring the hashtag #cancelthesimpsons. While some are interpreting that as a pointed insult, others have been quick to observe that the entire show has been marketed with the #cancelsouthpark hashtag for its 22nd season. In fact, whatever commentary South Park was trying to make wasn't completely clear enough. After all, The Problem with Apu creator Hari Kondabolu and The Simpsons' Al Jean have two entirely different interpretations. "It's actually in favour of us saying people are too critical," Jean said. "Hari Kondabalu tweeted he thought they agreed with him but pulled the comments showing he was wrong. All season the show has had a #cancelsouthpark hashtag so my response (which I tweeted) is: #pleasedontcancelsouthpark."